Two years earlier Drs. Beck and Ellis first met face-to-face for an historic dialogue on the nature of cognitive therapy as seen through their unique filters. In an admixture of clinical material, history, humor, and theory, these two legends seemed to hold quite similar beliefs about beliefs, and the inherent power of dysfunctional beliefs to paralyze healthy cognition and behavior through self-defeating schema. Now, 2 years later the dialogue resumed, again moderated by past APA President Frank Farley. 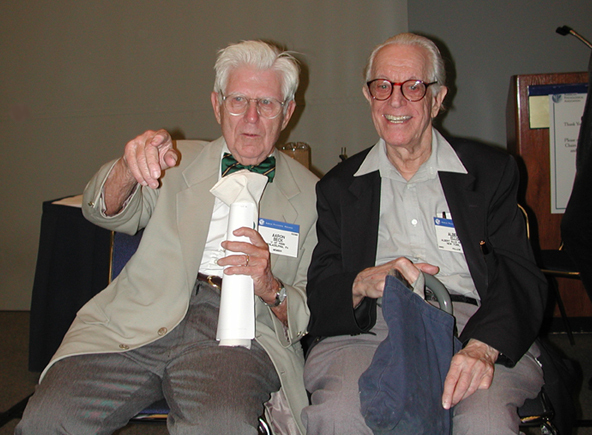 Although there was still a great deal of interest, apparently, in eliciting from these two giants of cognitive therapy some reflections on how they differ or where they disagree, once again there was clearly more similarity than difference and once again Beck tended to focus on recent empirical studies while Ellis preferred anecdotal history and clinical data. Of interest, Ellis described how, long before "emotional intelligence" became a popular idea, he had worked to implement programs in public schools, from nursery school on, to teach coping strategies based on rational-emotive principles. This came from his conviction that "not only had we better show other people what we do but we better teach them...all kinds of self-help things...which will reach millions". He would start by training teachers to instill a positive sense of self in the value of each and every student "whether or not they're loveable". The question was asked, where are their respective approaches now headed? Continuing with amplification of his thesis, Ellis noted that "today we still say that activating events or adversity don't make anyone upset by themself. It's the Bullsh--". A major goal is to "show people how to change their feelings, in emotional and behavioral ways." He said that in fact he does integrate other points of view now, after "finally getting over psychoanalysis". He pointed out that "we always have self-help criterion and all sorts of visual aids" and concluded that "we hope to get back to emphasizing that REBT and cognitive therapy be taught to everybody in K to 8. That will really be effective." Beck, who confirmed being born in 1921 [He is 81 and Ellis 89!] reflected on the future from perhaps a more medical model, noting that "I think where the field of psychotherapy is going is more in line with the treatment of mental illness". He has been actively working with various (diagnostic) populations and establishing both treatment protocols and assessment instruments. Beck cited a newly completed study with a borderline personality population in which it was demonstrated that after 10 sessions, adding a cognitive therapy component to treatment led to more effective prevention of suicide. He is working on a second study looking at schizophrenia. In discussing the latter study he noted that medication compliance (or lack thereof) tends to be an important factor, adding that a major cause of death among schizophrenics is diabetes, for the simple reason that they do not take their medications. "I forgot to say that one of the more integrative approaches -- especially with personality disorders -- we pushed them to experiment with medication. But like everything else in life, medication can be done obsessive-compulsively. Medication has good points and bad points, and can be neutral. Experiment, experiment, with each individual case!". Invited to reflect on some of his own observations over time, and how they may be relevant across cognitive approaches, Beck described how he has come to understand the dynamics at play in treating different populations. For example, "when we treat panic we try to reactivate it; with depression it's the opposite. With mania we try to teach people to see life more realistically. As I understand REBT there is much more of a generic approach -- An ABC [Affect-Behavior-Cognition] approach applied across the board." Next Ellis took up the gauntlet, declaring that "I could spend an hour speaking about the similarities. They're both *choice* therapies. People over-generalize: 'I failed a few times, I'm a failure and will be a failure forever'. They both dispute beliefs, logically and heuristically. Both result in profound change, lasting a long long time. Both collaboratively work with patients. Both address core beliefs. Both treat personality disorders. Both try to help people help themselves." "I agree", said Beck, "but one distinction I would make, and that has to do with the term 'irrational'. We don't always know the extent of dysfunction. We don't believe, a priori, that something is irrational. One person has special skills." He noted that it is a task of the skilled therapist to explore what may be irrational or dysfunctional, and he re-iterated that there needs to be an empirical basis for employing a given approach with a given situation. The question was then asked, for whom does their respective therapy approach work best? No matter when you started, you continue telling yourself B.S. You need to continue the rest of your f---ing life! Beck added that "we found that some therapists work well with sociopathics, others with other types. There is something in terms of the match with the therapist". Beck has become increasingly interested in "working with challenging populations". One such population can be daunting -- the borderline -- because of a tendency to *split* (ostensibly a cognitive process). "They are not unlike terrorists", he said, "seeing everything in good versus bad terms". But they can be made to "flip" from one side of the split to the other, he has found, "even in their view of their selves, [or] from an idealized to a depreciated view of the therapist", for example. He noted that "here is where specialized treatment approaches need to be developed". Beck described relevant research with Borderlines and an interesting finding of apparently successful long-term results, though with some residual of past functioning. Using a "belief scale", after treatment a group went from a score of 7 to 2 on the "borderline criteria", but "one thing persisted: fear of abandonment". At 6 months follow-up there was evidence of continued higher functioning and the fear of abandonment was "down" but still present. Ellis noted that "I've been working with borderlines since at least 1943. My opinion is that at least 30% of our population, including past and present Presidents, are serious borderlines." Ellis was asked about his efforts to go into classrooms and supplement traditional academic teaching with emotional regulation skills. A stumbling block is working with administrators, apparently. "We had a school ourselves, 1970-1975. We taught the teachers and they worked with the clients. So first you cure all the teachers [and then they apply REBT] in the classroom situation. They even do group therapy in the classroom. We found it quite successful but it had to be pushed and pushed and pushed." Asked if looking over their distinguished careers they would have done anything differently, Beck said he'd have to think about that. Ellis however had a ready answer: "Of course I learn by experience and I've made numerous errors along with my brilliant observations". Beck was asked if he's ever adopted some of the great theories such as Frankl's. [In 2000 he noted how he sometimes considered himself a "closet psychoanalyst" given his early training.] "Not really", he replied now. He finds himself less enamored with theory and more with "hands on". For example he recalled how "one client tried to translate an existential dilemma into here and now. I personally don't deal well with those very abstract problems, for example deciding on a graduate school, but others do this exceptionally well." Ellis is one who has no difficulty trying to dispute more existential dilemmas. His approach: "If you model and open up, they'll learn. Open up and discuss with them and teach them existential philosophies which you hope they'll work their asses off on the rest of their lives." Ellis answered a question about the concept of "denial" and how it may be central to their theory and practice. He noted that the concept came from "the Freuds... but they never said what to do about it". He looks at the basis for the denial, thoughts like "I must not be depressed, I must not be anxious" and *teaches* people to accept rational realities rather than engage in denial. At the same time he promotes "U.S.A - Unconditional Self-Acceptance". Beck, in repeating his call for empirically based treatments, mentioned that he is very interested in developing new scales to help in assessment, and in fact he has recently developed 7 new scales, such as an OCD scale which was available (with autographs!) following the presentation. Copyright © 2002-2011 Michael Fenichel. All Rights Reserved.